Bookings are now being taken for this forthcoming programme. Successful modern manufacturing processes rely on accurate practical information and the ability of staff to understand and apply such information. In a global and competitive marketplace, knowledge and skills are increasingly important. To address this issue, SATRA has designed the internationally renowned SATRA Accredited Footwear Technologist (SAFT) training course for all technologists involved in any aspect of footwear production. The next opportunity for delegates in the USA to learn on the SAFT course is October 3rd to 18th 2019. These sessions will be held in Costa Mesa, California, with modules covering the key areas of footwear production. Each module is taught in a two-day intensive training period by SATRA experts, and comprehensive documentation is provided to support the lecture and some practical sessions. Delegates to these sessions can take any or all of the modules being taught, and once the course has been completed, there is an opportunity later to take optional written examinations. The SAFT award gives clear evidence that the recipient is a footwear technologist with a proven range of knowledge. On completion of the course, students have an opportunity to later take optional written examinations, which are held twice a year. Passes must be achieved in five of the six modules for students to receive a SAFT accreditation. There is no need for all five examinations to be taken at one time, however, passes in all the papers must be obtained within two years to obtain accreditation. Module one is a core section which covers lasts, fitting and comfort, and focuses on footwear from the customers’ perspective – what they expect from their shoes in terms of fit and comfort, and how the manufacturer can satisfy these expectations, to thus maximise sales and develop brand loyalty. This section investigates foot structure, function and foot health, biomechanics and the gait cycle, comfort factors such as cushioning and sweat management, shoe size systems used around the world, last design, construction and shape assessment, and fit assessment. The second module – also a core part of the course – helps the student to understand materials (considering the key materials and components used in footwear), and construction – investigating common processes and less well-known methods. Module three is on the testing of footwear. It starts with a discussion on ‘what is testing?’ and ‘why is testing important?’, as well as the use of specifications, accurate and detailed test reports and standard test methods. The module also provides an overview of the key tests which are carried out on footwear and materials, such as for upper and lining materials, solings and footwear components, in addition to whole shoe tests. 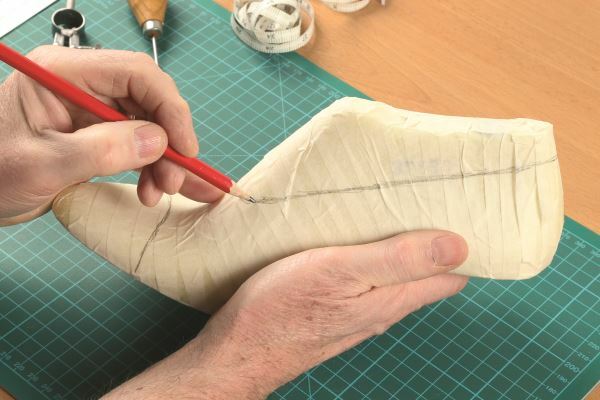 The fourth module covers product design – in which delegates will tape up a last, flatten the shell and produce inside, outside and mean formes, as well as making their own examples of graded patterns. The process of shoe costing will also be discussed, examining the way materials, labour and expenses are calculated to produce a final selling price. Module 4 also considers all aspects of lean manufacturing, covering implementation and techniques involved, including value-added and non-value-added processes, pattern engineering, the assessment of leather usage, shoe sizing/grading, stitching efficiency and ergonomics. The final core part of the course is module five. This investigates risk assessment associated with product liability when the footwear fails or causes injury (or damage to property) in wear, with practical exercises in assessing the risks of specific footwear items. It also considers quality assurance, and will provide participants with an understanding of the purpose, organisation and content of a quality management system, in addition to an appreciation of how to apply this to the student’s own company needs. The sixth module looks at the requirements of industrial footwear as outlined in all the major industrial footwear specifications and standards. It will contrast and compare the various requirements, such as impact resistance and slip resistance, and review common faults and failures, as well as the precautions to be taken to avoid this happening. The SAFT course will also be held in the UK on 11th to 26th November 2019. Please visit www.satra.com/events or email training@satra.com for further information on the value of training to be a SATRA Accredited Footwear Technologist and the SAFT USA course. This article was originally published on page 50 of the April 2019 issue of SATRA Bulletin.